One of the principal drivers contributing toward the expansion of high altitude platform market is the escalating involvement of renowned behemoths in the development of unmanned technology. For instance, a major contractor of the U.S. defense, Lockheed Martin had invested USD 100 million in 22 several start-up technology companies in 2016. Within the next year, Lockheed Martin ventures funded USD 60 million to start-up companies, which have currently been working across several domains such as cybersecurity, nanosatellite, and autonomous technologies for trucks. Collaborating with start-ups will thus help companies contribute favorably in commercial and military applications, which would have a proportional impact on the application landscape of high altitude platform industry. Apart from the U.S., the Chinese government has been also encouraging giants in high altitude platform market to invest in American firms for developing advanced robotics and artificial intelligence technology for high altitude platforms such as UAVs and airships. In this regard, it is noteworthy to mention that the competitive hierarchy of high altitude platform industry is inclusive of big shots such as Avealto Ltd., Lindstrand Technologies Ltd., Aerostar International, Inc., Airbus SE, Israel Aerospace Industries Ltd., TCOM L.P., Rafael Advanced Defense Systems Ltd., Thales Group, Raytheon Company, and Lockheed Martin Corporation. Since the last few years, the U.S. Ministry of Defense has changed its perspective toward advancements in the defense sector. Recently, the U.S. Army Space and Missile Defense Command (SMDC) signed an agreement with Pentagon organizations to develop solar powered sensor platforms. This advancement validates the developments spanning the manufacturing and commercialization of drones, satellites, and UAVs, that would certainly have a positive impact on U.S. high altitude platform industry share. in addition, the deployment of solar powered sensor platforms is likely to benefit the U.S. army with regards to intelligence improvement and surveillance capability enhancement. Statistically, it has been observed that the growing implementation of autonomous vehicles for surveillance applications led to high altitude platform market crossing the billion-dollar frontier in 2016. In a recent development witnessed across high altitude platform market, the subsidiary of the Airbus Group, Airbus Defence and Space has designed an innovative solar-powered aircraft - Zephyr. This high-altitude pseudo satellite has been endowed to provide satellite-like Earth observation and communication services with minimum costs, as it can move in an orbit in the Earth’s stratosphere beyond the line of sight. Pertaining to the capability of this product to capture real time video and images in practically all the weather conditions, it has been predicted that it would be extensively used for civil, security, and military applications. This benchmark set by the Airbus Group will impact positively on UK’s investigation, surveillance, and intelligence capability, which will favorably boost Europe high altitude platform market size. Apart from UK, Germany has also taken initiatives to develop UAVs, which is a marked improvement for the country, given that it had been leasing drones from Israel for surveillance purposes earlier. Speaking along similar lines, the Federal Government of Germany is looking forward to becoming a global technological leader with regards to innovations in safe, clean, and competitive air transport system manufacturing. The German government has framed aviation strategies to encourage high altitude platform for industry participants to carry out significant research and development activities, as many prime parts suppliers have their bases established in Germany. Alongside, there have been ongoing advancements in the technology sector of the country to improve the production and maintenance of unmanned systems for defense and commercial purposes, which would certainly propel Germany high altitude platform market over the years ahead. In order to improve their respective defense industries, many countries have lately been signing intergovernmental deals. For instance, recently, India and Israel have signed an agreement to manufacture short range missiles under the Make in India policy. Under this deal, Israel Aerospace Industries will be collaborating with the Indian Defense Research & Development Organization to work on a project related to the production of various radar systems, aircrafts, and UAVs. This defensive strategy of the Indian government to invest in UAVs and other related technologies such as RADAR will apparently help the country combat terrorism, while simultaneously impelling the regional high altitude platform market share. 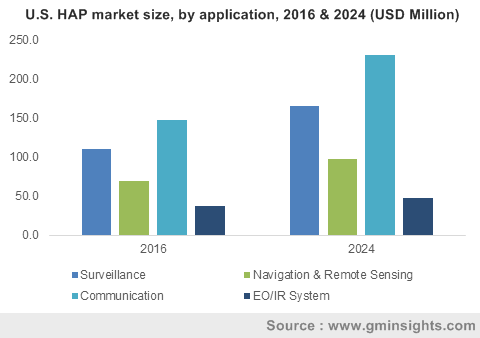 With significant developments in wireless technologies and artificial intelligence, high altitude platform market is likely to experience an exponential growth potential over the years ahead. Many researchers and high altitude platform market giants have been focusing on the development of microwave-powered platforms as well. Nowadays, pertaining to the benefits such as low-cost system availability, lower rain attenuation impact, capability to cover larger areas, eco-friendly working and lesser time required to kickstart the system, high altitude platforms are preferred over current terrestrial and satellite systems. The massive application spectrum of this product testifies that it would indeed form a major part of urban infrastructure in the ensuing years. Driven by its robust demand across myriad domains, experts claim that high altitude platform market will generate a revenue of more than USD 1.5 billion by the end of 2024.